We provide a range of advice and consultancy to both customers and equipment manufacturers on how the unmetered electricity arrangements operate within Great Britain. 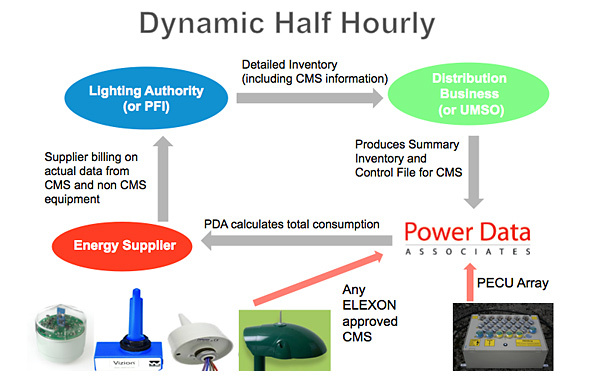 Power Data Associates is able to assist manufacturers with applications for ELEXON Charge Codes (UMSUG codes) which are essential for any equipment to be used on an unmetered basis. As the leading Meter Administrator working with Central Management System (CMS) we have assisted CMS manufacturers with the ELEXON approval process and ensuring the system meets the ‘real world’ requirements. Unmetered customers benefit from our advice on the best method of trading their unmetered equipment, updates on the latest ELEXON and industry developments and general knowledge on inventories and unmetered processes. This is the most accurate trading method available for unmetered supplies. It uses the data available from a PECU Array and/or a Central Management System (CMS) to accurately calculate kWh consumption each day. It is referred to as ‘Dynamic’ because it is taking actual recorded measurements and using this information in the calculations. Although described by the Carbon Reduction Commitment as ‘pseudo Half Hourly metering’ it is still unmetered. 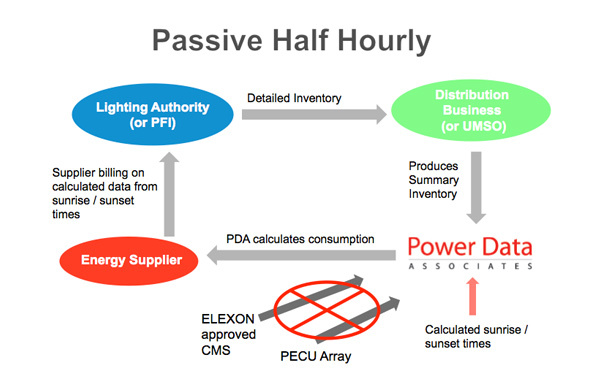 Passive Half Hourly is the same as Dynamic Half Hourly except that it cannot use any actual recorded data and instead relies on the calculated sunrise/sunset times. Passive Half Hourly does not use any data from a PECU Array or CMS. Non Half Hourly (NHH) trading was originally intended for unmetered customers with small inventories such as Parish Councils with a handful of street lights. 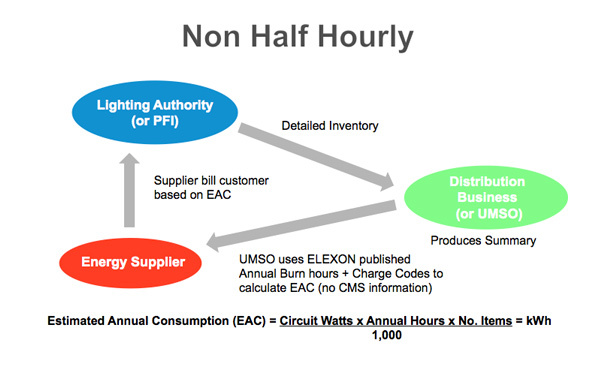 The Estimated Annual Consumption (EAC) is calculated by the Distribution Business using a published annual hours figure and does not use any data from a PECU Array or CMS. Energy/Carbon reporting options are limited using this method of trading and there has been a sustained move by the large unmetered customers trade their unmetered energy Half Hourly.